"Figuratively Speaking: A Group Exhibition"
The human figure has been the fundamental muse for as long as people have been creating art. Far from the caves and rocks on which we first scrawled, the artists in Figuratively Speaking have developed a sophisticated language to explore the human condition through a variety of figurative studies. Each image is a highly personal, riveting look into the ongoing process of living. Included in "Figuratively Speaking", which runs from February 29 until March 20, 2008, are wroks by Yaron Ari, Corinne Boureau, D. Loren Champlin, Karen Jarvis, Liu Ji, Gretchen Reynolds and Sain-Morar. 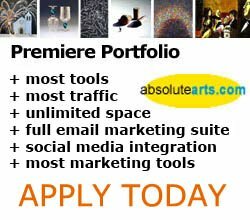 D. Loren Champlin has been a Premiere Portfolio Artist at absolutearts.com since April 2007. The highly textured portraits by painter D. Loren Champlin express the tumultuous experience of an intense inner life. His artwork is, as he says, "calculated chaos resulting in harmony" through his skilled fusion of lines and color within the human bodies he paints. Even if his subjects are motionless, the textures which make up their bodies reveal a multifarious nature. Champlin's artistic vision is focused on merging the moment of inspiration with the commitment of painting. To capture the human life in a single instant, in a pose, or embrace, Champlin exceeds the bounds of portraiture and inhabits an expressionism reminiscent of fellow Norwegian Edvard Munch. Tides of color roil around his subjects like auras, and are echoed in similar ebbs within the limbs and faces of those he brings to the canvas. The human condition has always been Champlin's concern, and that vulnerability is expressed, ironically, in his bold brushwork and the tumult it conveys. D. Loren Champlin's paintings embrace the fleeting moment wherein the human character is revealed. View more of D. Loren Champlin's works in his Portfolio at http://www.absolutearts.com/portfolios/d/dlorenchamplin/.